Freshmen Taylor Kissinger and Kate Cain combined for 37 points, 12 points and six assists, including 18 of Nebraska’s final 26 points to lead the Huskers to an 80-69 women’s basketball win over Arkansas on Thursday night at Pinnacle Bank Arena. With the victory, Nebraska improved to 3-0 while Arkansas slipped to 2-1 with loss. Kissinger, a 6-1 guard from Minden, Neb., poured in 25 points while adding eight rebounds, four assists and a steal. She scored nine straight points in just over a minute on three straight threes in the first quarter to help shoot the Huskers to an early lead. She added four points and an assist in the final 4:30 to lead Nebraska back from a 67-65 deficit with just under six minutes in the game. Overall, Kissinger hit 9-of-15 shots from the field, including 4-of-7 threes and 3-of-4 free throws. Cain added five points during the final 5:30 while adding several key rebounds and blocked shots. Her basket with 5:30 left tied the game at 67, before Kissinger found her inside on a driving assist that Cain finished high and was fouled to give NU the lead for good at 71-69. That was the start of an 11-0 run to end the game, as the Husker defense held the Razorbacks scoreless for the final 3:56. Cain, a 6-5 center from Middletown, N.Y., finished with her first career double-double with 12 points and 10 rebounds, while adding four blocked shots. She hit 4-of-8 shots from the field and 4-of-7 free throws, including one with 56.3 seconds left to give Nebraska a three-possession lead at 76-69. 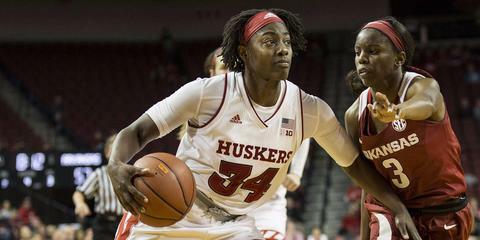 Senior Jasmine Cincore was also huge down the stretch, making several key defensive plays and hitting all four of her free throws in the final 8:10, including a pair with 2:37 left to give Nebraska a 73-69 edge. The 5-10 guard from Arlington, Tenn., finished 4-of-7 from the floor including a connection on her only three-point attempt, while knocking down 5-of-6 free throws on the night. She added five rebounds, three assists, a team-high three steals and a blocked shot of her own. Sophomore Bria Stallworth sealed the victory with four straight free throws in the final 32 seconds to finish with nine points off the bench. However, she and fellow sophomore point guard Hannah Whitish combined to go just 3-for-21 from the field and 1-for-10 from three-point range on the night. Despite those numbers, the rest of the Huskers stepped up in big ways. Junior forward Maddie Simon gave Nebraska a huge lift inside with a career-high 12 rebounds, while adding five points and three assists. Sophomore forward Rachel Blackburn put together her best performance of the young season with six points and four rebounds while drawing a pair of charges in just 10 minutes off the bench. Sophomore Grace Mitchell contributed four points, six rebounds and a steal in 11 quality minutes off the bench, and senior Emily Wood buried a three-pointer to give Nebraska nine players with points and nine players with at least one rebound in the game. The balanced Big Red attack allowed the Huskers to overcome 22 points and six assists from Arkansas point guard Malica Monk and 21 points and five three-pointers from shooting guard Devin Cosper. As a team, Nebraska hit 38.9 percent (28-72) of its shots, including 7-of-21 three-pointers (.333). The Huskers also finished 17-of-25 (.680) at the free throw line after opening the game just 2-for-8. The Big Red outrebounded Arkansas, 55-45, including a season-high 22 offensive rebounds. Arkansas shot 35.1 percent (27-77) from the field, including 8-of-32 (.250) from three-point range. The Razorbacks also went 7-for-10 at the line and won the turnover battle, 16-15. After trailing 41-30 at the half, Arkansas outscored the Huskers 22-17 in the third quarter to make it a two-possession game at the end of the quarter. The Razorbacks then cut the lead to one point for the first time at 62-61 on a layup by Taylah Thomas with just under eight minutes left. The Razorbacks took their only lead of the game at 67-65 after back-to-back three-pointers from Cosper with just under six minutes left. Nebraska took a 41-30 lead to the locker room at halftime behind hot early shooting from Kissinger and balanced scoring up and down the lineup. Kissinger hit three consecutive threes in a 1:17 stretch in the opening quarter to shoot the Huskers to a 13-7 lead and force an Arkansas timeout with 5:44 left in the quarter. However, Cosper answered Kissinger’s early production with 10 first-quarter points to tie the score at 15 with four minutes left. The Huskers then responded with a 7-0 run with baskets from Mitchell and Blackburn surrounding a three-pointer from Stallworth, who added NU’s last field goal of the quarter to take a 24-19 lead into the second. Nebraska then played outstanding defense to open the second period and got eight straight points beginning with a Cincore steal and layup, and capped by Cincore’s three-pointer to give the Big Red a 32-19 lead with 6:40 left in the half. Cain added a bucket with 6:02 left in the half to give the Big Red their biggest lead of the game at 34-20, before Arkansas ran off six straight points. But Blackburn and Simon scored Nebraska’s final seven points of the half in the final 4:30 to give Nebraska an 11-point halftime edge. Kissinger led Nebraska with 11 first-half points, while Blackburn added six points and three rebounds off the bench. Simon, Cincore and Stallworth each added five first-half points. Simon added six rebounds and three assists, while Cincore contribute three rebounds, two assists and three steals in the opening half. Mitchell also contributed three rebounds and a steal. Nebraska hit 44.7 percent (17-38) of its first-half shots, including 38.5 percent (5-13) of its threes. NU went just 2-for-7 at the line, but outrebounded Arkansas, 27-22, and won the first-half turnover battle, 10-9. Cosper led Arkansas with 12 first-half points, while Monk pitched in eight points in the half. Arkansas hit 33.3 percent (12-36) of its shots, including 4-of-14 threes in the first half. The Razorbacks were 2-of-3 at the line. The Huskers will complete their four-game season-opening home stand by taking on in-state rival Creighton on Sunday. Tip-off at Pinnacle Bank Arena is set for 7 p.m. with tickets available now at Huskers.com. Jasmine Cincore finished with 14 points and three steals.